Awake at 7.45am. The aim is to leave at 8.45am to go to the Animal Kingdom so Susan can ride Expedition Everest. Unfortunately Deb has had a rough night and is feeling a little tired so she and Matt are going to have a relaxing morning. The rest of us get the bus to the Animal Kingdom and are entering around 9.30am. Over to Expedition Everest where we get Fast Passes for 11.30am. 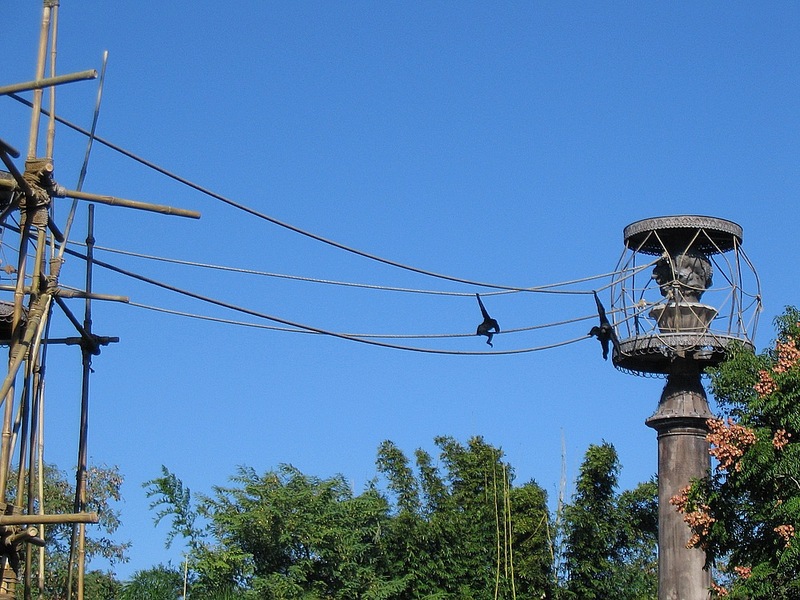 As we walk past the monkey temple the monkeys are having a good time swinging on the ropes and generally entertaining the gathered crowd. We go to Dinosaur next and are on in less than 5 minutes. Its India and Georgias first ever time, although Georgia doesnt actually see much as she keeps her eyes closed the whole time. This isnt going on her list of favourite attractions. After this we take the train to Rafikis Planet watch. Susan has never done this before and we go into the rainforest sound booths before Georgia meets Pochahontas and has her photo taken. Daddy lurks at the back enviously. They are doing a routine check-up on a meerkat in the veterinary area and it is fascinating to watch the team of people at work. The poor little meerkat doubles as a pincushion he has so many injections. Susan says he must have pretty good health insurance with all the attention hes getting. You could easily spend a couple of hours here seeing all there is to see, but its time to use our Fast passes for Expedition Everest. When I say we I dont mean me. I have decided that discretion is the better part of valour and decide to sit this one out. I would love to do it again, but the resultant illness is just not worth it. I sit in the viewing area at the bottom of the big drop and write up my trip report. India says she is going to wave her red Hooters hat (thats my girl) as she goes past and I actually manage to spot her as they hurtle by. Susan comes off the ride and says that she loved it. Constitution of an ox that woman. It is now time for lunch and we choose the Flame Tree Barbecue. Perhaps it should be called a barbequeue as it takes nearly half an hour to get our food. The best part about this place is that the seating areas are split into many small sections covered in trees and vegetation so it never seems too crowded. 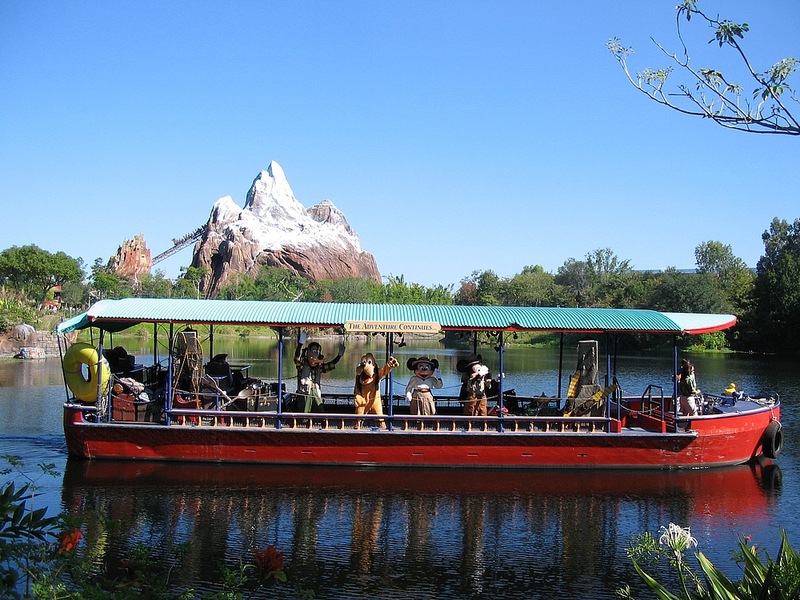 We sit close to the lakeside with a fantastic view across the water to Expedition Everest. The food quality is mixed, we enjoy the BBQ beef sandwich but the ribs are a little dry. 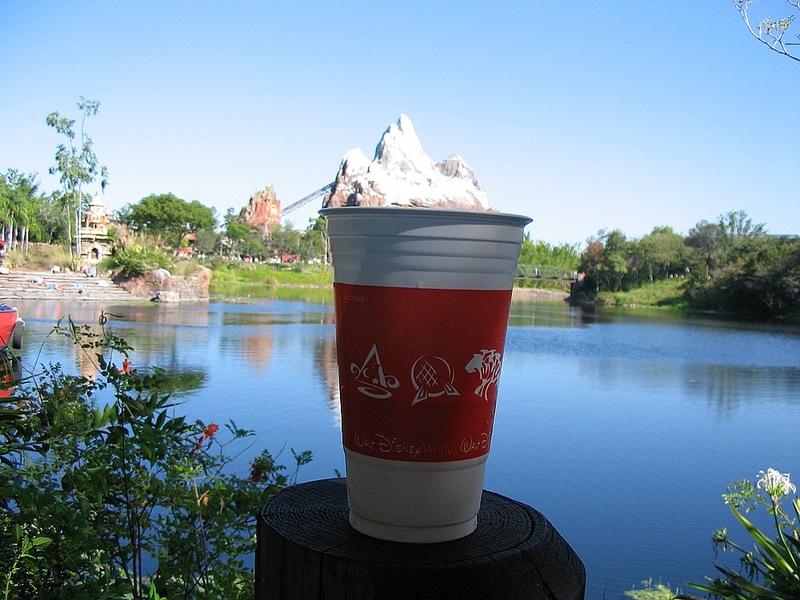 My good friend Mr Beer enjoys a view of Expedition Everest. Typical! As soon as there's a beer available the characters come sniffing round. It's mine I tell you, mine. Having enjoyed a few hours in the Animal Kingdom we now catch the bus back to the Boardwalk. Waiting for us on our pillows are invitations to visit Ohana on Wednesday evening to celebrate both Georgia and Susans recent birthdays. Georgia is now 13,but wild horses will not make me divulge Susans age. A womans 60th birthday is her own business. Damn it, it just slipped out. You must admit from looking at her photos that she doesnt look anywhere near this. Shes a sort of Petronella Pan. A rest by the quiet pool is called for. There are a few people around, but no children, as they prefer the slides and fun of the main pool. Its great just to relax and enjoy the perfect Florida sunshine, its 77° and clear blue skies today. Back in the room we met up with Deb and Matt who have been out to the Disney MGM Studios. 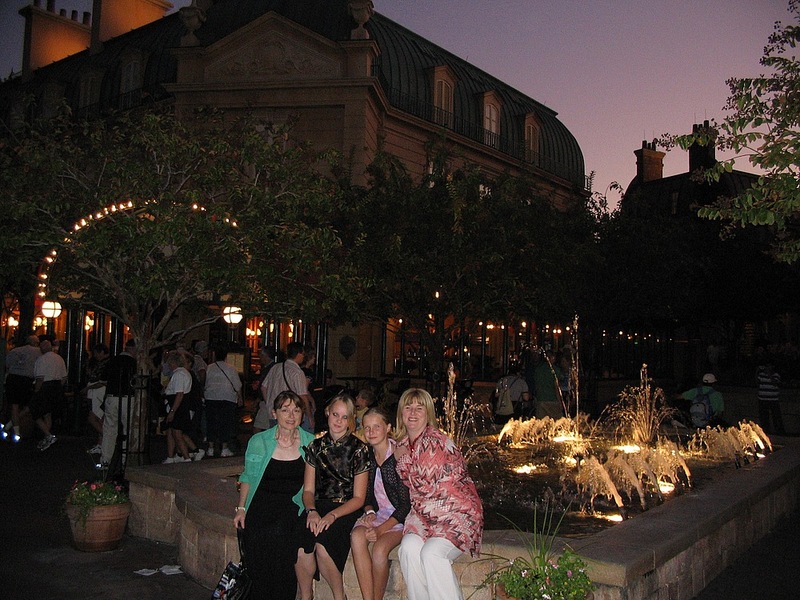 Everyone showers and we are off to Epcot to eat at the Bistro de Paris in France at 5.40pm. This is quite a nice restaurant, but we dont have the best table and its always going to suffer in comparison to last nights excellent dining experience at Victoria and Alberts. Something that is quite unusual for dining in Epcot is that they dont rush you at all, in fact we are still enjoying our meal over 2 hours after we first entered the restaurant. I have the consommé to start, which is actually rather lacking in taste. Me, Tam and Georgia have the lamb as our main course, while India tries the venison. Both are pretty good. 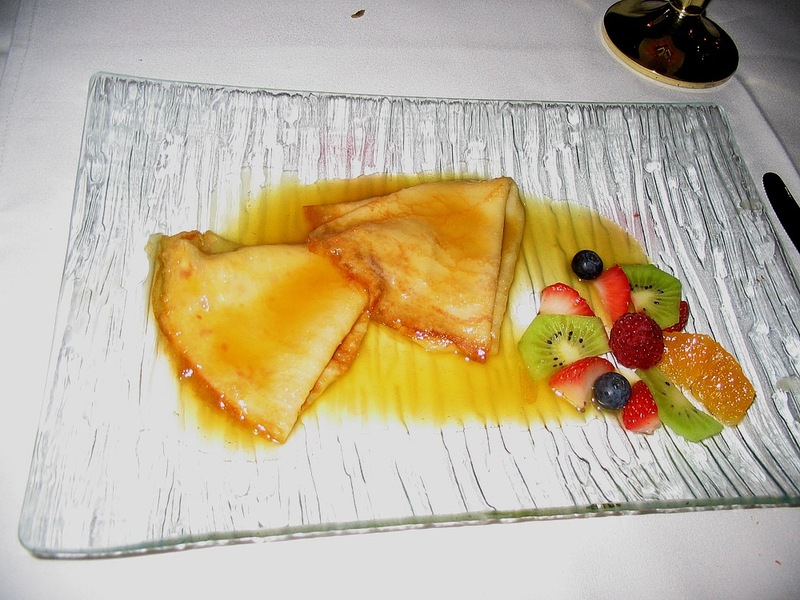 Probably the best thing about our meal is the crepe suzette Tam and I share for dessert. 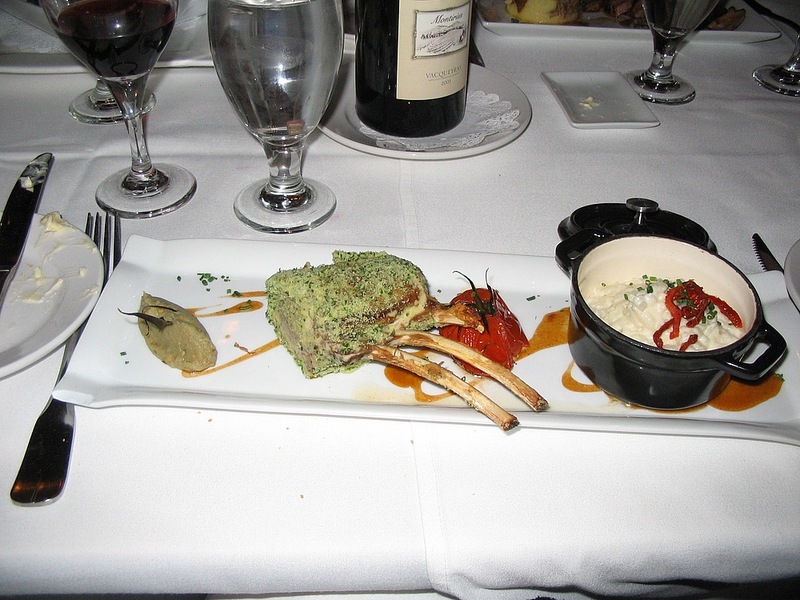 This is prepared at our table by our French waiter, Anthony. What sort of French name is that? Antoine or Maurice or something, but Anthony? This is probably just jealousy on my part as he is a rather good looking young chap and Tam and Ind are fawning over him like love struck schoolgirls, which is probably alright in Indias case, but somewhat embarrassing in Tams. Anway, he cant even speak proper English like wot I can, with his Zis is ze dezzert madam. He do wanna lern to speak proper like we does in Gloucestershire. 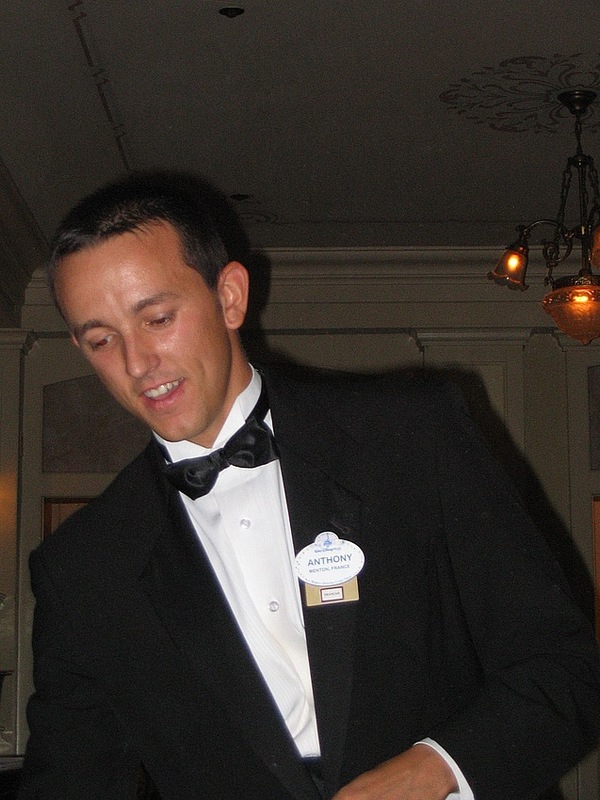 Jealousy aside, he is actually a very personable and likeable server. The whole meal is not cheap, setting us back $200 for the 4 of us and this includes taking advantage of Deb and Matts Disney Dining Experience card. Thats the trouble with our girls growing up, cheap meals off the childrens menu are rarely an option even though I try to convince Georgia that the burger and fries are excellent here. After the meal Deb and Matt go back to the room while the rest of us watch Reflections of Earth from Japan. This is a different experience for me and its ok, but never going to beat my favourite spot in Norway. One good thing is seeing the globe float out from close up. Time for bed at 11.00pm.